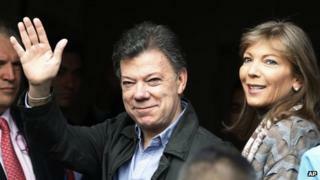 Colombian President Juan Manuel Santos is recovering at a clinic in Bogota after undergoing surgery for prostate cancer. His medical team said the surgery, which only required local anaesthetics, had been successful and that he would not need chemo- or radio-therapy. Mr Santos will be discharged on Friday or Saturday, doctors say. He took Colombians by surprise on Monday when he announced that he was to have a cancerous growth removed. The news comes as the Colombian government prepares to enters landmark negotiations to end nearly five decades of conflict with left-wing Farc rebels. President Santos, who is 61, intends to carry his duties as usual, but he will not be allowed to travel as he continues to recover at home with his family. "The surgery took place without problems whatsoever. Recovery is taking place now," the president's urologist, Felipe Gomez said at the Santa Fe clinic in northern Bogota. Mr Santos, who took office in August 2010, is the latest Latin American leader to be diagnosed with cancer. Others have included Dilma Rousseff of Brazil, her predecessor Luiz Inacio Lula da Silva, Venezuela's Hugo Chavez, as well as former President Fernando Lugo of Paraguay. Before the operation, Mr Santos said the disease had been diagnosed early. "I am optimistic. God willing, everything will be fine," he said.